Panel Built modular offices by QuickBuildings Modular in Mobile, Alabama are specifically engineered for flexible design, ease of installation and durability. 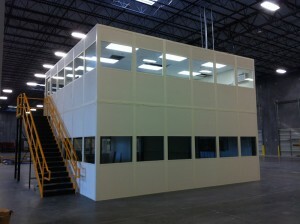 Panel Built’s modular office systems provide safe, quiet inplant offices for staff and visitors. Whatever your space need, Panel Built has a modular building solution. Need help planning your modular office system? No problem. QuickBuildings Modular in Mobile, AL can help you plan the perfect solution for your modular building needs. A modular office system is the perfect way to keep your employees comfortable in a warehouse or manufacturing environment. Panel Built modular office systems provide a clean, well-lit and temperature controlled workspace. 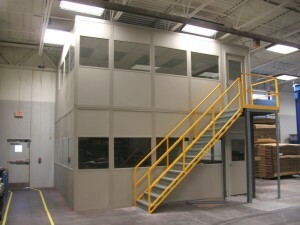 Put your modular office on a mezzanine for the most efficient use of space and a bird’s eye view of the facility. Ideal for offices, break rooms, cooling booths, observation towers, clean rooms and equipment enclosures. Heavy duty industrial platforms are excellent for supervisory inplant offices, metal range towers, vision towers and more. Mezzanine systems from Panel Built, Inc. provide a clear view of plant work areas and convert wasted vertical space into productive work environments. 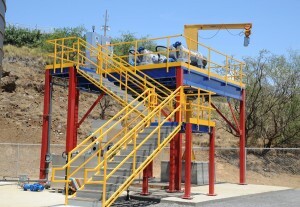 These rugged load-bearing mezzanine systems support two-story construction and can meet military specs MIL-B-28658D. 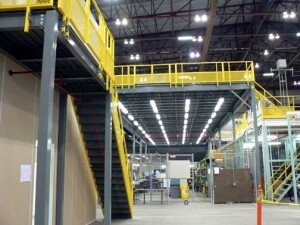 Additionally, Mezzanine-Built systems can be designed to accommodate virtually any space requirement. Mezzanine-Built powder coated steel mezzanines are built to your specification including custom sizes, heights, spans, decking materials, landings and stair systems. Heavy-duty and long-lasting, Panel Built provides the safest, lowest-maintenance, and most productive 2-story metal structures available today. Specifically engineered for flexible design, ease of installation and durability, Panel Built’s modular office systems provide safe, quiet inplant offices for staff and visitors. Whatever your space need, Panel Built has a modular building solution. Need help planning your modular office system? No problem— Panel Built’s world-class engineering and customer service stands behind every modular office installation. modular office on mezzanineA modular office system is the perfect way to keep your employees comfortable in a warehouse or manufacturing environment. Panel Built modular office systems provide a clean, well-lit and temperature controlled workspace. Modular Office Wall Connection System for fast installation. Polystyrene Core – an economical, lightweight panel with high r-value. PBI’s versatility allows you a choice of wall panel designs and finishes. Our modular walls can be expanded polystyrene. We also offer a one hour fire rated core safety barrier made of steel studs and mineral wool. At the panel joints, you can utilize our exclusive 1” wide vinyl divider strip or a conventional aluminum extruded binder post. Our surfaces are limitless. Our most popular 1/2” vinyl covered drywall is great for fire, sound and cost. We also utilize aluminum, steel, hardboard, fiberglass reinforced plastic (FRP) porcelainized steel, plywood and virtually any type of surface you can laminate. Our system is the most versatile. While we are happy to supply you with a standard “off the shelf” 8’ x 10’ structure, we have the capability to make any size structure to within a 1/4” tolerance. Call QuickBuildings Modular for a FREE quote.